If you're not familiar with John Corey Whaley's work, then GET FAMILIAR WITH IT. He is an author that should be a part of everyone's library. His debut novel, Where Things Come Back, blew me away & has been a favorite for the last two years. 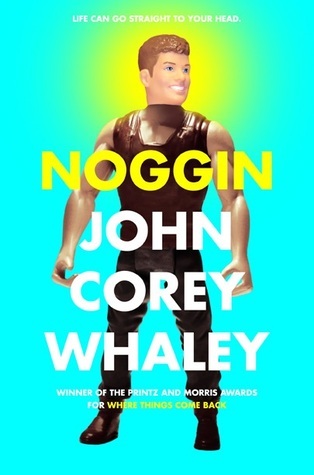 NOGGIN is exactly what I've been craving from Mr. Whaley and surpasses everything a sophomore novel should be. He stretches the boundaries while weaving together the most brilliant story filled with humor and compassion like nothing you've read before. If you had the opportunity for a second chance at life, would you take it? Travis Coates is dying. His body can no longer keep up with him, and he's ready to be at peace. Just when the fight may be over, he's given the opportunity for that second chance. A chance that involves freezing one's head and reattaching it to a donor body, a healthy body. So what happens when you wake up 5 years later, with your head attached to some stranger's body, and everyone you love has either moved on or has refused to let go? Travis Coates can tell you, and that story is the one you all must read! About the Book from Goodreads: Listen — Travis Coates was alive once and then he wasn’t. I snagged a copy of this one at NCIBA and I'm really looking forward to it! I haven't read anything by John Corey Waley, but I'm definitely excited for this one! Thanks for sharing!